◆ important: ☑ take a 10-minute break to cool down between 2 flights; ☑ use the stop button immediately when the quadcopter is entangled by hair or other filament, or tends to clash,or out of your control. Related remote control:please search b06y5jbvxx; for spare batteries: please search b06y51b6w4. Fpv camera & live video: first person view real time video camera (0. 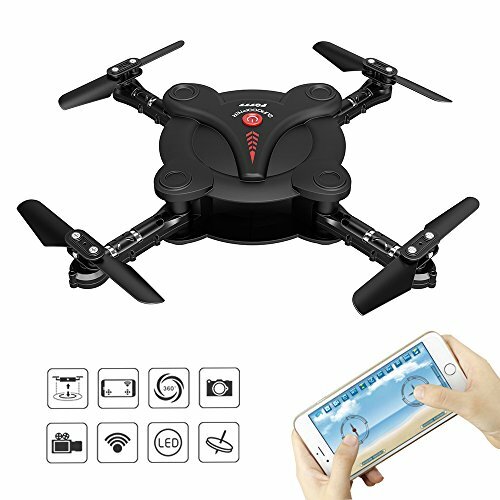 3mp) of the drone is able to take aerial videos and photos in camera's horizontally forward direction with smartphone device (both ios and android system). Images and videos will be listed in both app and mobile album system. Scan the qr code or search vs_ufo in google play or app store to download the app. Foldable & flexible aerofoil:foldable & flexible aerofoils and blades not only make the palm-sized drone compact, small and portable but also prevent users from being cut and provide better and safer using experience. No faa registration: this quadcopter doesn't require a faa registration - excellent drone for beginners and hobby users. Drone's remote control height:20-30 meters;remote control distance:50-80 meters;video transmission range:about 20-30 meters. Flying time of the drone:7-10 minutes for sustained flight times; charging time:40-50 minutes(under currents input 0. 5a-1a). If you have any questions about this product by Kidcia, contact us by completing and submitting the form below. If you are looking for a specif part number, please include it with your message.